A monument commemorates the South Australian citizens of German, Austrian, Hungarian and Polish descent who were interned at the Torrens Island Internment Camp during World War One. Up to 400 ‘enemy aliens’ were interned in the camp which opened on 9 October 1914. Internees were mainly of German or Austro-Hungarian background, including some who were naturalised British citizens. Some internees were crew members of enemy nationality who were taken from ships in Australian ports. In South Australia, a relatively high percentage of migrants were of German background, and so the ‘enemy alien’ concept had a significant effect. Conditions at the camp were very harsh, with the internees being housed in tents and made to cater for their own cooking requirements, including growing their own food. Despite these hardships, the inmates managed to organise cultural events and entertainment, and even published a number of editions of a camp newsletter called Der Kamerad. In early 1915, the camp was placed under the command of Captain G. E. Hawkes and conditions worsened, with reports of physical abuse and ill-treatment. The third issue of Der Kamerad reported the flogging and whipping of recaptured escapees. 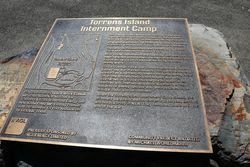 Torrens Island Internment Camp ‘… had by far the worst reputation of all internment camps in the Commonwealth’ (Fischer, p. 194). After the internees made their complaints public, Hawkes was removed from his command and the Department of Defence held two courts of inquiry into the running of the camp. After the findings of a court of enquiry into this treatment of internees was submitted, the Defence Department closed the camp on 16 August 1915. The federal government had also decided to close regional camps that had been set up in the early years of the war. Many prisoners, including South Australian internees, were transferred to the Holsworthy Camp. This plaque is dedicated to the memory of the 400 German, Polish and Austro-Hungarian "enemy aliens" who were interned on Torrns Island during World War I. An enemy alien in law is a citizen of a country in a state of conflict with the land in which he or she is located. The camp on Torrens Island was opened on 9 October 1914 and closed on 16 August 1915. Prior to the internment camp opening, internees had been detained at the Keswick Army Barracks, where the Fourth military district had the authority to intern enemy aliens. On 29 October 1914, the Commonwealth parliament passed the War Precautions act. This gave the military authorities wide-ranging powers to intern enemy aliens. Under the act, any naturalised subject who was disaffected or disloyal could be placed under arrest, searched and interned. Any Australian-born Britsh subjects of enemy descent who were believed to be disloyal could also be interned. When the Torrens Island Internment Camp closed, the prisoners were relocated to camps in Liverpool, Berrima and Holsworthy in NSW. They remained there until the end of the war. 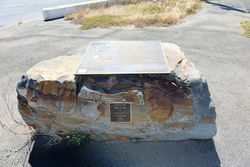 Plaque unveiled by Hon. Patrick Conlon MP, South Australian Minister for Transport, Infrastructure and Energy and Hon. Kevin Foley MP, Deputy Premier and State Member for Port Adelaide on 16 October 2009. Community project initiated by Michael Wohltmann.